November saw the Cornwall Air Ambulance crew carry out 87 missions to people in need of urgent medical care throughout Cornwall and the Isles of Scilly. Throughout November a total of 52 missions were flown in the air ambulance helicopter and 35 were carried out using the charity’s critical care cars. Medical emergencies accounted for 54 missions, including 31 people suffering from heart related problems. There were also 33 missions to people who suffered serious injuries, including seven incidents during sporting activities, 11 road traffic collisions and 11 emergencies involved children. 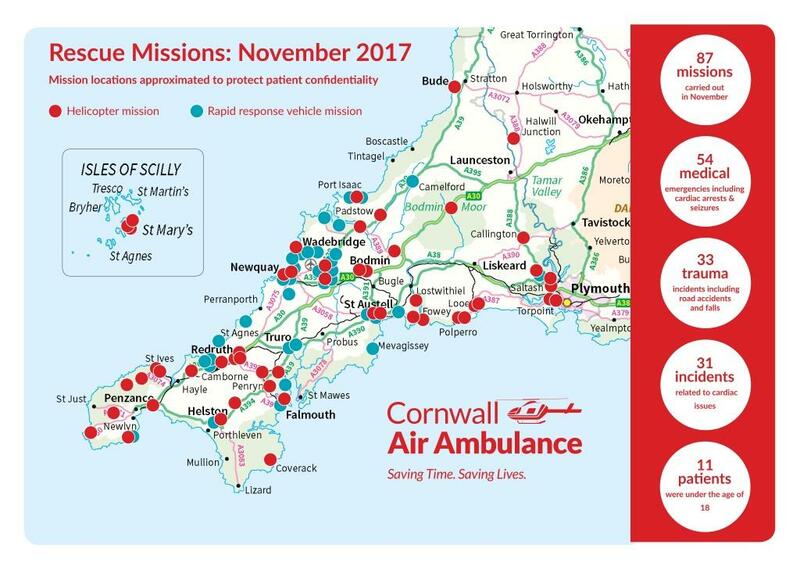 Cornwall Air Ambulance paramedic, Mick Mclachlan, said: “As a charity, we rely on donations to keep the air ambulance flying which means not a single one of the 87 missions carried out in November could have been flown without the support of the people of Cornwall and beyond.